The motorcycle in Television: The Italian Machine. "The Italian Machine is part of the CBC series Teleplay, runs for 24 minutes and Shot on location on 16mm film, this was written and directed by David Cronenberg. Lionel, Fred and Bug are three bikers, motorcycle obsessives who hang around a workshop and listen to recordings of the Isle of Man TT races for relaxation. One day Bug storms in with astonishing news – a glorious Ducati 900 Desmo Super-Sport, one of only forty ever constructed, has been bought not by a biker, but by an art collector who has no intention of riding it and instead plans to stand it in his living room as an exhibit. Insane with rage at this sacrilege, Lionel is determined to rescue The Italian Machine from this appalling fate. The Italian Machine's a story told very much from a biker's perspective – the outrage that some middle-class art collector could take a great motorbike and turn it into an object d'art comes very much from the heart. 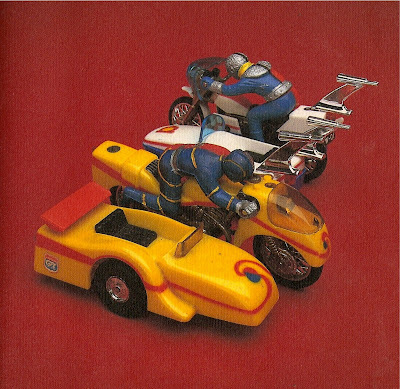 This sense of outrage finds its on-screen expression in Lionel, who explodes into fury at the thought, stamping a table to pieces and having to be wrestled into a chair by his companions and calmed by the soothing sound of TT racing commentary." 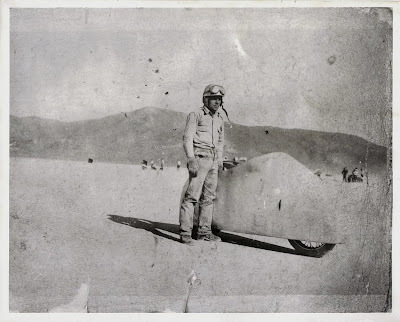 "The Gyronaut held the overall motorcycle speed record of 245.667. The body designed by Alex Tremulus who also designed a number of Ford Motor Company concept vehicles. 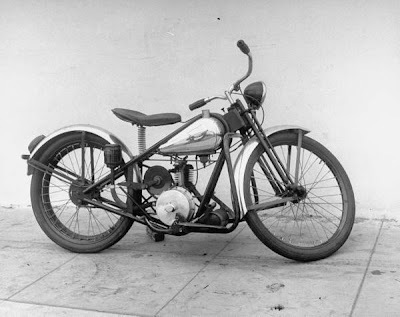 Originally the plan was to put a Ford small block V-8 in the Gyronaut but it was later decided that a complete motorcycle concept was the way to go. 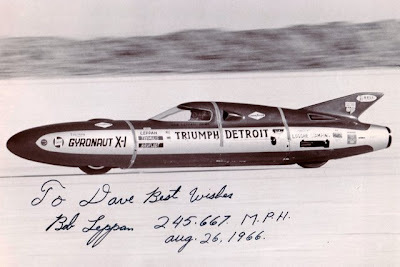 Bob Leppan, co-owner of Triumph Detroit drove. 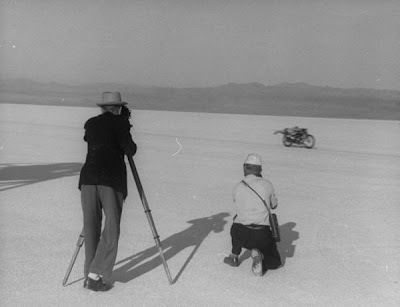 In October 1970 Bob returned to Bonneville and went head to head with a Harley Davidson Streamliner driven by A.M.A. 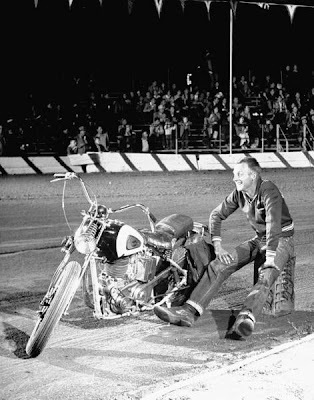 flat track superstar Cal Rayborn. Harley snatched the record and Leppan was ready to respond. "Then it happened. The thing that all high speed riders fear. 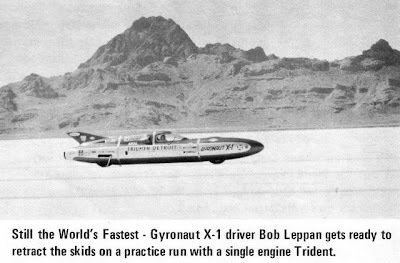 Bob was winding out the Trumpet down the course at over 270 MPH approaching the measured mile. The front suspension collapsed and before any reaction was possible (like popping the drag chute) the bike started tumbling and rolling from side to side. Bob Leppan became a member of the Two-hundred MPH Crash Club and it nearly cost him an arm. During one of the gyrations of the Gyronaut, Bob's arm was ground into the hard-packed salt. The ripped and shattered limb was a candidate for amputation but Bob insisted on trying to save it. .....Bob Leppan is now recuperating from the highest speed "get-off" any biker has ever taken". Bob never regained full use of his reattached arm. 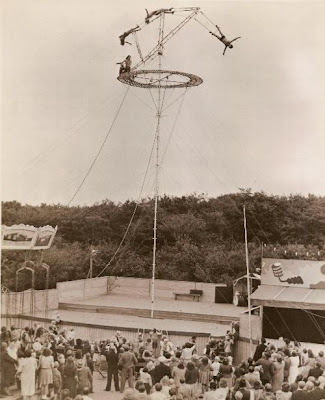 The Gyronaut never returned to the salt and a number of years later Triumph-Detroit, which had expanded into Jaguar and British Leyland car sales, went bankrupt." 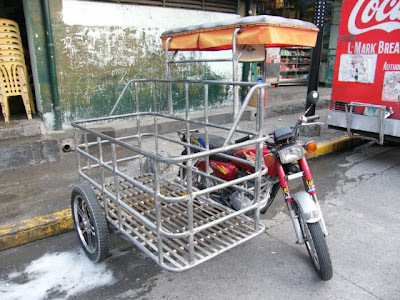 Youtube: Alphonse Maniriho's most special bike taxi. In 2002 Swarovski, the world's largest crystal company, is attracting attention by finding unconventional uses for its glittering stones. 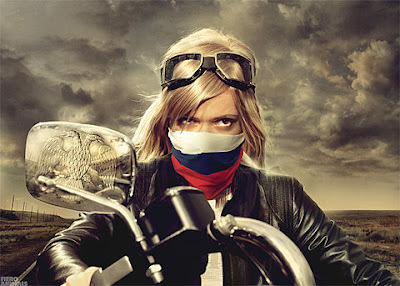 Nadja Swarovski, the company's international communications director, has enlisted designers to create original items, including clothing, home decor-and even motorcycles. The crystal company, based in Austria, worked with Coco Chanel and other top-notch designers starting in the early 1900s. As a result, an $11,000 Kawasaki Ninja motorcycle became the raw material for the designer Leeora Catalan of Noir, which is known for its funky clothing accessories. Swarovski approached Catalan, who covered the sleek Ninja with 50,000 crystals, some as small as an eighth of an inch in diameter. Even the thin wheel rims sparkle, and purple crystals spell out Ninja on the side of the bike, which was featured on the cover of Mariah Carey's "Glitter" CD. and then put on display at the Shop Noir in SoHo for a time. Vintage 2001: The Honda E-Dax. 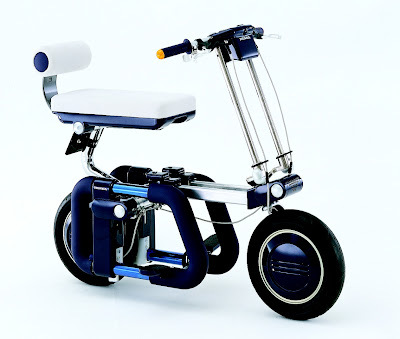 This new-genre electric motor-powered bike doubles as the rear seat backrest of the Bulldog on display in Honda’s automobile corner. With a chassis weighing in at just 25kg, it’s designed for easy handling when loading it into the car. Genius at work: James Secord's bike in progress. 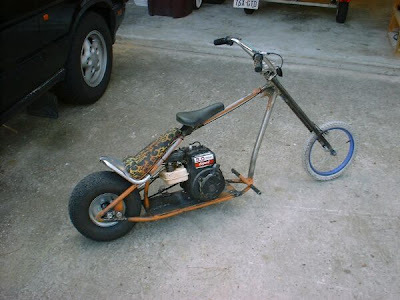 "Here is my first motorcycle custom. I've been riding a 1985 xv700 Yamaha Virago for ten years now. I figured it was time to use my metalworking experience to make some desired changes to my beloved bike. The flares on the side of the fender were shaped to take a pair of 1949 Dodge Coronet turn signals. The head light bucket is off a 1938 Chevy coupe. As you can see its “super-hero” BIG. I love it! Flash Gordon comes to mind. I used the local muffler shop to bend some 40mm pipe and then constructed a single carb manifold. Getting rid of the dual carb set-up clears out a lot of crap a bike just doesn’t need. 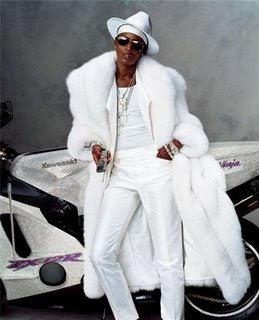 The jet was way rich and I had blue flames shooting everywhere. Ran kinda like a pro-drag bike, flames and all.! Also, the return spring I put on the carb was way too weak. I rolled on the throttle and HOLY CRAP! It was scary. The slide just stayed up under vacuum and just fed the beast pure gas. I got the attention of all my neighbors and my wife even poked her head out to see if I was ok. With all my shop related accidents, her concern was justified." "This is not just another run-of-the-mill electric bicycle, all thanks to its stunning style, motorcycle styling and solid performance. With its unique design the Marrs Cycles undeniably stands out from the crowd. The mission behind this electric cruiser was to handcraft a high-quality electric cruiser that rides like a motorcycle, but still falls under the same jurisdiction as a bicycle. 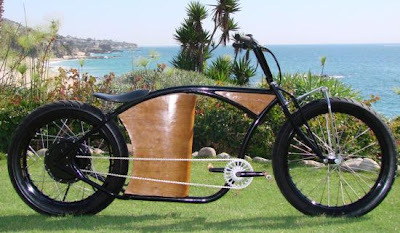 Handmade in Southern California, the Marrs Cycles electric beach cruiser is hand-crafted from scratch, including the frame, handlebars and leaf-spring front ends. 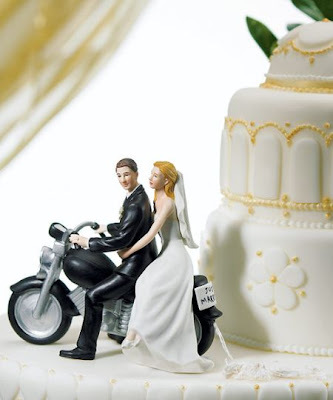 The highest quality motorcycle components have been used in the making, including Excel rims, 10 gauge motorcycle spokes, Metzeler motorcycle tires, and springer solo motorcycle seat and springs to bestow the bicycle with those tough looks. An Avid 4-piston hydraulic brake and large 9-inch rear rotor accounts for the stopping power. The rear hub-motor system is complemented by the real wood veneer battery box to give unparalleled classic styling." 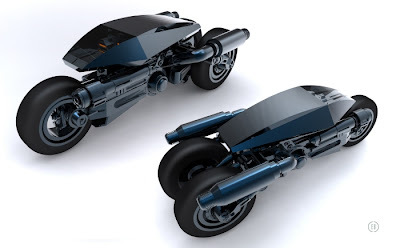 Eric Brown's robot motorcycle robot concept. 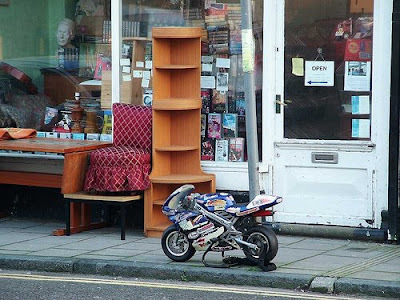 "I actually conceived of this before the Terminator bikes! Amazingly, I was thinking along the lines of the Terminator just the same and made the finish highly reflective as to reflect laser fire. Black chrome, much cooler than silver chrome. " 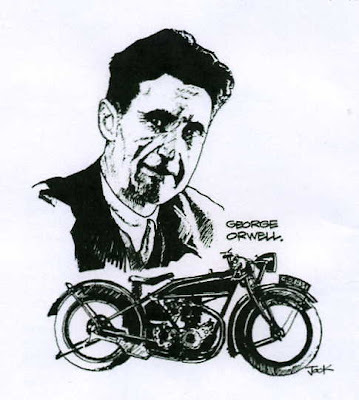 In search of George Orwell's motorcycle. Eric Arthur Blair-otherwise known as George Orwell-and his Rudge. In "Jura and George Orwell" a book written by Mrs Nelson who was the wife of the Laird of Ardlussa, Robin Fletcher, from whom Orwell leased his cottage in Barnhill, Scotland in 1946-50. "...Transport was varied and unreliable. To begin with they had a rowing boat with an outboard engine and a motor bicycle which was constantly breaking down. Eric spent many hours sitting beside the road tinkering with the engine and hoping that someone would appear who had more mechanical knowledge than he had. My older children remember him (Orwell) often coming to the house, usually in oilskins, wanting help. 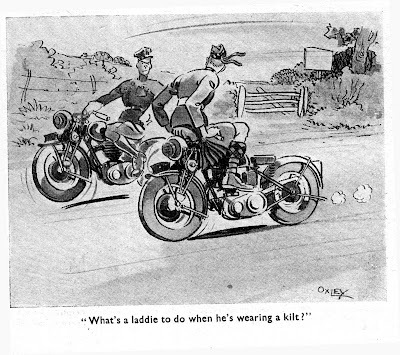 He often carried a scythe on the back of his motor bike with which to cut the rushes which grew rapidly in the middle of the road..."
Journalist, Allan Brown, went to Barnhill in search of Orwell's Rudge motorcycle which was rumoured to have been abandoned by Orwell when he left Jura, Scotland in 1950. Brown found no sign of the bike and the locals were unable to help him in his quest. However a letter arrived from someone who knew a little more of the story. It seems that Orwell took the Rudge down to the jetty on the day of his departure and sold it to the skipper of a small boat who plied a trade selling Calor Gas around the islands. He in turn sold it to a man at his next port of call (Colonsay) who used the bike until the end of its life and then scrapped it..."
Harpist Park Stickney ready for action. Pict via: Big Sky Harp Festival. 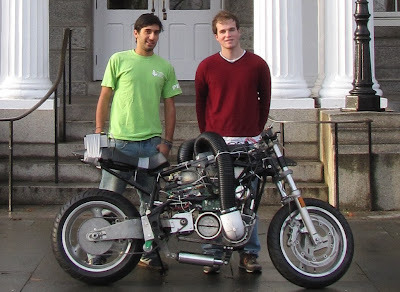 Alex Bell and Andres Pacheco's hydrogen fuel cell motorcycle. Ever wanted to build your very own motorcycle? Alex Bell and Andres Pacheco, senior engineering students from Swarthmore College had the opportunity to do just that, thanks to funding by the college’s engineering department. 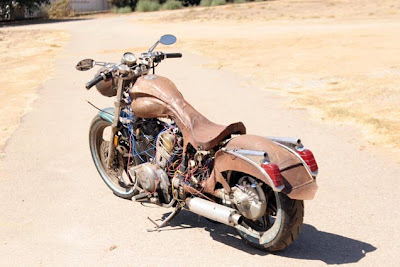 Spurred by their interest in alternative energies and vehicle efficiency, they have been working on building from scratch a “proof of concept hydrogen fuel cell motorcycle,” for two years now. “The goal of our project is to design and build a functional hydrogen fuel cell motorcycle and compare the efficiency data against battery and ICE motorcycles,” said Bell and Pacheco, in an article in Fuel Cell Today. They have posted a rough draft of their “Fuel Cell Vehicle Engineering Report” on their website with their specific design decisions, vehicle components, and fuel cell vehicle efficiency comparisons. 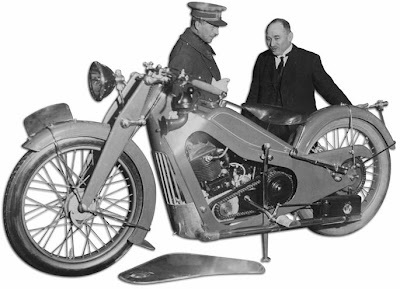 Bell and Pacheco estimate that the motorcycle has an average efficiency of 50%. After averaging in losses in propulsion, total vehicle efficiency is expected to be 46%." This number, which the two hope to increase to about 60% after further modifications and repairs, is very impressive, especially since, as you may know, traditional ICE engines only manage about half that. While you won’t see any of these bikes rolling around your town in the near future, these young engineers certainly appear to have a great future ahead of them, and hope to present their final paper (upon approval) at the American Society of Mechanical Engineers (ASME) Fuel Cell Science, Engineering, and Technology conference in June. 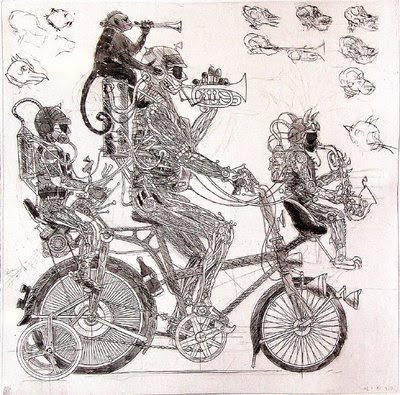 The two wheeled Symphony of the Absurd. 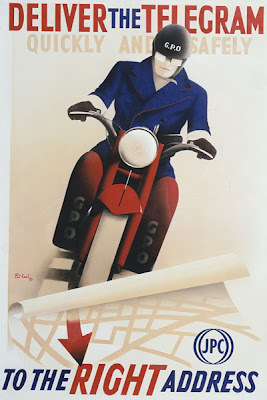 Flicker: Rain can shrink your motorcycle..
1934 Belgian La Mondiale using (a 500cc JAP motor). Belgian King Albert The first is on the left. Zen Moment: With this ring. 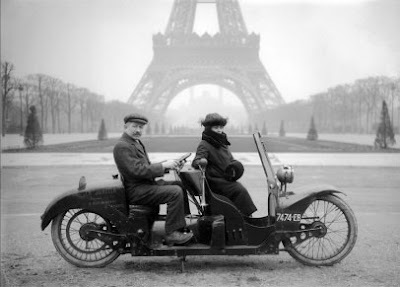 Two-seater motorcycle in front of the Champ-de-Mars. Paris, 1922. 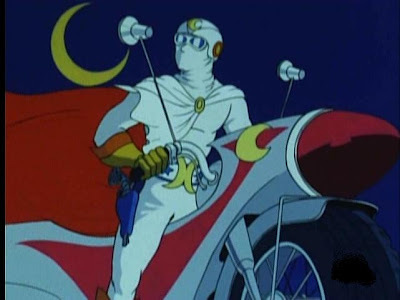 Moonlight Mask, was aired on Nippon Television from January 10, 1972 to October 2, 1972, with a total of 39 episodes (divided into three segments). 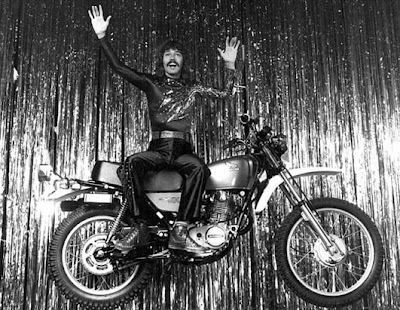 The show also became very popular in Latin America under the title El Capitán Centella ("Captain Flash"). Moonlight Mask-"The lover of justice"
Gallery: The Life Photo Archive. Coming Attractions: Sayonara Speed Tribes. "The HoughMade Cycle Works 71. Not a strict replica, it is an homage' to the motorcycles of the pre-WWI era. The frame is from a '90s vintage Huffy cruiser. The front fork is a reproduction Schwinn style springer. Hough fabricated "leaf springs" for the look, but their only function is as fenders. The wheels are from Husky- very heavy duty with thick steel and 11 ga spokes. It has a high quality coaster brake, but it also has calipers front and rear which is what is generally use for braking. The tires are all-white vintage style from Kenda. The tank is fabricated from fiberglass. Under the cover (and bonded to it) is a 1/2 gallon steel tank that can be bought from bicycle-engine vendors. The seat and headlight are from eBay. The seat is a vintage long-spring frame that was padded with modern foam and covered with goat skin. The headlight was a small railroad lantern. It throws light like a flashlight, bur will not be ridden at night. Also mounted in the headlight is the speedometer with a custom face. The bought an engine mounting plate, gearbox and other specialized hardware from a vendor who sold (past-tense) such things. 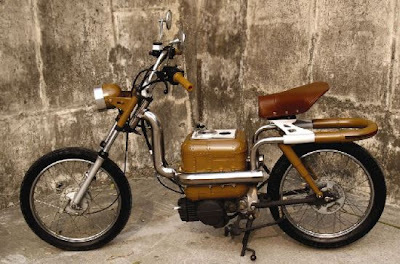 The engine is a brand new Honda GXH50 (49.4cc) with 2.5hp and custom-made side plates to pretty up the mounting plate and smoothed the grain off the plastic engine housing to mimic metal. " 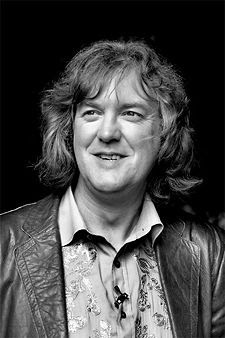 James May's rain of terror. "From where I’ve been sitting, which is on a motorcycle, it really is hard to believe that there are parts of the world where water is a bit short. There’s enough in my socks to grow rice for 5,000 people. These days, I seem barely able to sit on a bike without being soaked through to the marrow. I can wheel it out of the garage in perfect and stultifying sunshine, but within a couple of miles I seem to have ridden into the Fountains of Rome. For this reason, I now become quite cross with people who advertise second-hand motorcycles as having ‘never been used in the wet’. How can this be possible in Britain? 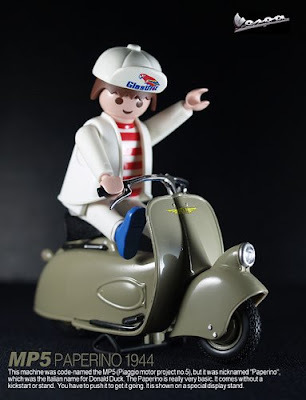 Show me a man who claims to have owned a motorcycle for 10 years and 20,000 miles without once being caught short, and I’ll show you either a card-carrying pork pieist or the long-awaited replacement for Michael Fish. 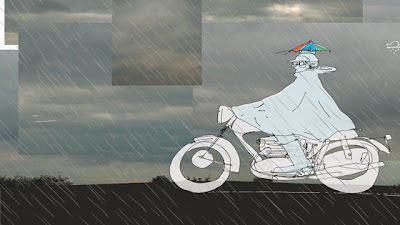 Of the last five motorcycles I’ve owned, four of them have been ‘used in the wet’ on the way home from the showroom. There are two things I want to say about this. The first is that, in the old days, I used to like a ride in the wet, especially once the rain had stopped actually falling. Wet-road riding requires a particular and stimulating set of skills: smoothness, anticipation, avoidance of potential treachery from manhole covers and the white bits of zebra crossings. The world smells great after a good dousing, and, providing you dry it off afterwards, a rinse is actually quite good for the bike. At least it gets rid of that difficult baked-on crud at the front of the crankcase. 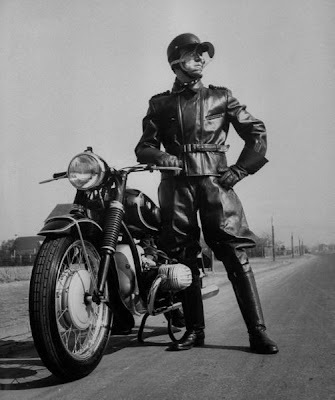 However, I’m now getting on a bit, and I’m ready to admit to being a fair-weather motorcyclist. Riding in the rain means wearing waterproof clothing, and since I find it hard enough to summon the energy to put normal clothes on, I really can’t be bothered. Also because I’m ageing fast, I find I always need a wee-wee as soon as I’ve done up the last zip or press stud, and that the bike key is still in the pocket of my normal trousers underneath. 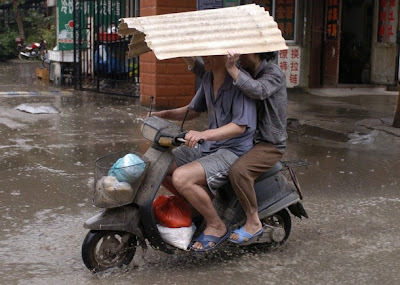 "'Waterproof motorcycle clothing’ seems to be one of the world’s great oxymorons"
Consider this. My current set of protective waterproofs requires that they be zipped together once on, around the waist, and in order to achieve this I have to adopt the stance of one inviting a swift mounting from a bull. It’s worse than watching a woman do the ‘tights dance’. Then there are boots and gloves and inner gloves and a balaclava thing, and the whole business can put your back out. In the time it takes me to put this lot on, I could be 100 miles away in the Fiat Panda. I can barely move dressed as a middle-aged mutant ninja turtle, so how I’m supposed to operate the sensitive levers of a big-bore bike I don’t know. And the second thing I want to say is this. ‘Waterproof motorcycle clothing’ seems to be one of the world’s great oxymorons. It doesn’t matter how thoroughly I do everything up, water comes in somewhere. It only needs to be a trickle down the neck or up a sleeve, but after an hour that’s a bath. Arriving anywhere soaking wet is bad enough, because then the sofa/office chair/doctor’s waiting room becomes wet as well. It’s even worse an hour or so later, because you start to smell like a damp dog. 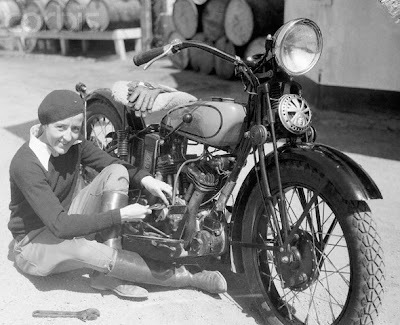 Motorcycling is a hobby, not away of life or an assertion of my masculinity. People who ride around in the pouring rain imagining that it makes them more of a man should go and live in a windowless bothy. Things are either waterproof or they’re not, and now I think about it, hardly anything is. Watchmakers seem to have cracked it, but why the hell does a mobile phone pack up as soon as it’s used near someone wearing a slightly moist sweater? Same with digital cameras, laptops, and anything made in Italy involving wires. Put these in a ‘waterproof motorcycling rucksack’, and the problem is simply compounded. I’m beginning to wonder if it’s all a plot. Waterproofing is still in its infancy, so the idea that a man can be kept dry in a 70mph driving headlong squall is ridiculous. Strangely, confirmation of my fears comes from no less an authority than the Australian army. They wear that type of cowled overcoat known as a Drizabone. Apparently, it’s also known as the Wetzabastard." 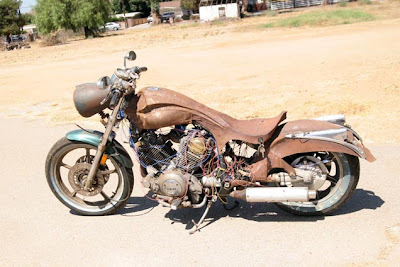 Choi Minsoo's steampunk hybrid motorcycle. 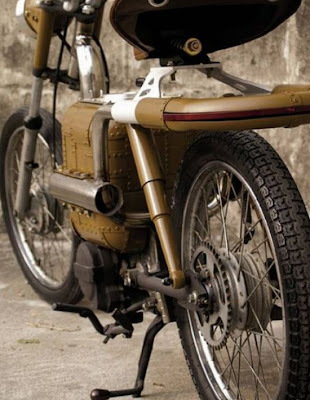 "Designer Choi Minsoo’s steampunk motorcycle is designed to be speedy and slim. 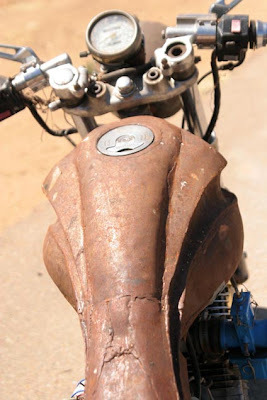 The handmade motorcycle follows the philosophy of the use of simple machinery. 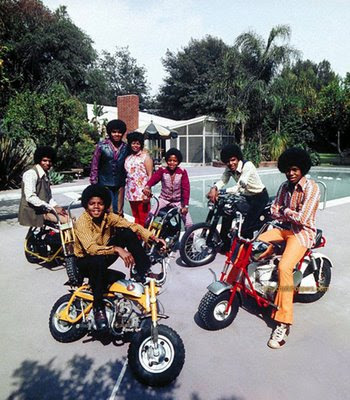 The hybrid motorcycle is powered by gasoline and electricity, and the big box on the frame holds the batteries." A very special alloy: Chogokin. 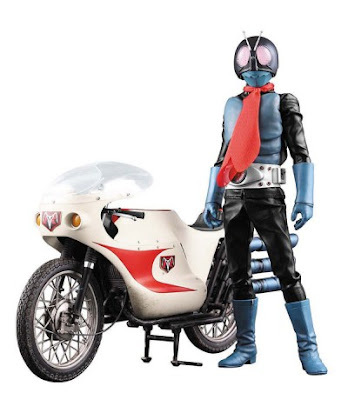 "Chogokin - Sometimes Chougokin or Cho-gokin - (超合金) is Japanese for "super Alloy" and is a fictitious material adopted by the Popy Toy company in 1972 as the name of a new line of die-cast metal robot and character toys sold in Japan and ignited a craze that changed the face of the Japanese toy industry in the 1970s. 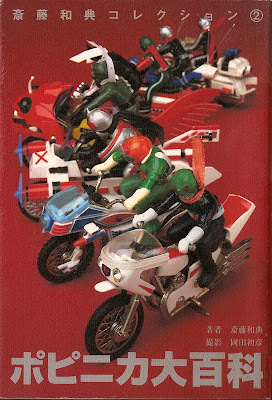 Bandai - the parent company of Popy Toy - continues the Chogokin line to this day, branded under their own name." 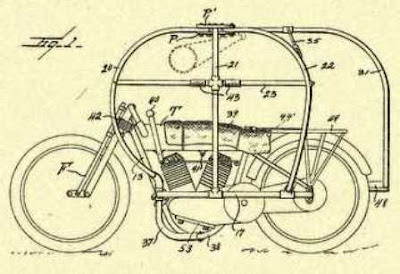 Patent Pending: Motorcycle Sidecar For Polo Playing. Whats a laddie to do? 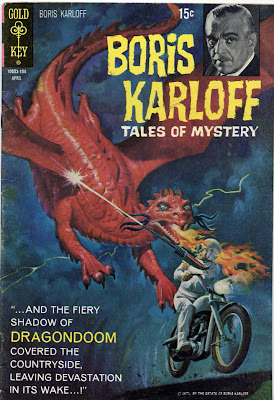 The obscure scooter club: The Mystery. Fast art: Cole Foster's Moon Rocket. Youtube: Chris Barrie on old bikes. 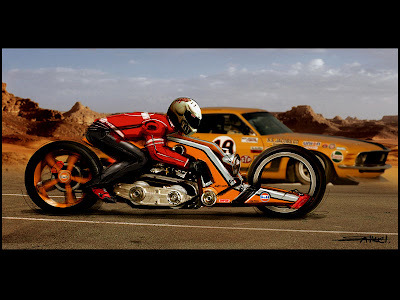 Ebrahim Tawil's "childhood dreams" concept bike. 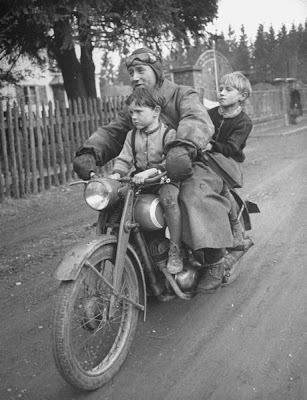 "All roads are smooth to The Flying Merkel"
Riding through No man's land. The Art of Bill Phelps. I am curious plastic-Man and machine. Jean Baptiste De Clercq's I/O. Fast art. Firestarter Garage's Bellerofonte. Young Nelson goes to the seaside. this looks like a job for: HeroWear. 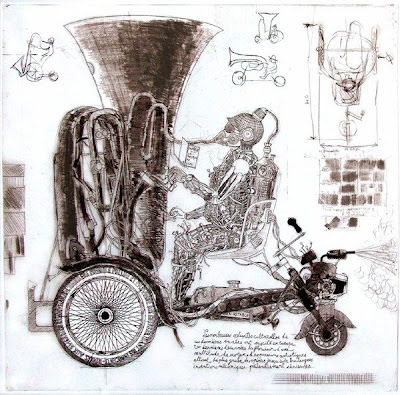 The Art of Maxwell Paternoster. Youtube: Running away to the Continental Circus. Gallery: The Short history of the Autobiroue.